In the practice of watershed management and ecosystem restoration, especially at feasibility study stages, the efficiency assessment of planned measures (i.e., designed buffer zones and strips) plays an increasingly important role. For this purpose, a simplified assessment method has been developed by the author. It is based on catchments and appeals to the use of soil and topographic land use maps (from 1:2000 to 1:10 000) normally available for detailed planning. The values of the parameters in eqns — are estimated on the basis of combined empirical data and data from the literature. Riparian buffer zones are defined as perennial (extensively used cultivated grasslands along watercourses (normally 50200 m wide). Riparian buffer strips are forests or bushes (5-50 m wide) growing directly on the stream banks. The most problematic part of the calculations is the estimation of the mean annual value of nutrient runoff from catchments (Xc). In this case, the approach is rather simplified and based on the mean annual fertilization intensity and soil structure of the catchment. In addition, if the aim is only to estimate the buffering efficiency of designed buffer zones and strips (E), the Xc value will be eliminated (eqns -). Figure 4 A schematic view of a river valley with typical ecological engineering measures for controlling nutrient transport from the watershed. where E is the summary buffering efficiency of designed buffer zones and strips (%), YBZ is the buffering efficiency of designed buffer zones (kgyr ), YBS is the buffering efficiency of designed buffer strips (kgyr J), Xc is the mean annual nutrient runoff from the catchment (kg ha 1 yr 1), and Ac is the area of the catchment (ha). where ABZ is the area of the designed buffer zone (former arable land converted into perennial grassland; ha), 0 is a coefficient showing the average decrease in nutrient runoff from perennial grasslands in comparison to arable land (0arable land = 1-0; this value can vary over a large range - in the case study catchments presented in the next paragraph of this article, the 0 values for N, P, and BOD5 were 0.5, 0.7, and 0.5 respectively). where K is a coefficient showing the proportion of nutri ents and organic matter transported through overland flow (in the case of studied catchments, the K values for N, P, and BOD5 are 0.5, 0.8, and 0.7, respectively); e is for the average buffering effect of forest/bush buffer strips (% m 1; in a buffer strip of 1 m width, the e values for N, P, and BOD5 are 3, 4, and 4%, respectively; for buffer strips wider than 10 m, the nonlinear retention function must be used); mi is the width of a designed buffer strip (m); Am is the area of the elementary catchment of a designed buffer strip of mi width (i.e., the area from which overland flow entering the buffer strip will be formed; ha); the value of Am will be derived from topo graphic land use maps. where XA is the nutrient runoff from arable lands (kg ha yr ); Aa, Apg, and Ana are the area of arable lands, perennial grasslands, and natural biotopes, respectively (ha); 0Pg and 0NA are coefficients of nutri ent runoff from perennial grasslands and natural areas correspondingly when compared to arable land (0A = 1.0). For 0Pg values, see explanation to equation 2; 0NA values for N, P, and BOD5 are 0.1, 0.05, and 0.1, respectively. The percentage of buffered stream banks was calculated according to the equation B = lb/^lt 100%, where lb = length of all stream banks In the catchment (m), having a buffer zone or strip between field and stream, and = total length of stream banks In the catchment (m). The percentage of unbuffered stream banks was calculated as follows: U = lu/^lt 100%, where lt = length of all stream banks in the catchment (m), having agricultural fields up to the bank of the stream. The percentage of stream banks with natural communities was calculated as follows: N = ln/^lt 100%, where ln = length of all stream banks in the catchment (m) bordering on natural plant communities. Adapted from Mander U, Kull A, Kuusemets V, and Tamm T (2000) Nutrient runoff dynamics in a rural catchment: Influence of land use changes, climatic fluctuations and ecotechnological measures, Ecological Engineering 14(4): 405 417.
unbuffered stream banks. One of the explanations for this is the more complex landscape pattern in the Sipe subcatch ment, which shows better buffering capacity. In Sipe, in addition to the complex buffer zone (45% of the 6.6 km long main stream is buffered), the stream has a meandering valley with a well developed hyporheic zone. In the Vanda subcatchment, the main stream is completely straightened, has no meandering parts, and only a very short fragment of it has a buffer zone on both banks that constitutes 7% of the total length (4.8 km) of the stream (Figure 5). transport from slopes prevails the streambed sedimenta tion. On the other hand, intensive denitrification and P sedimentation were observed in a small storage lake (Figure 5). 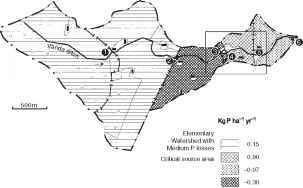 However, in 1998, 12 years after its construc tion in 1986, the storage was saturated with P and it turned from being a sink to being a source of P.
* Elementary Watersheds with Negative P balance v.."
Figure 5 Average N and P budgets (kg ha 1 yr , calculated on the basis of stream water quality measured each month from 1987 to 1991 at six closing weirs/measuring points along the stream), and the content of N-NO3 in the shallow groundwater (mg l 1) of elementary watersheds in the Vanda subcatchment area. Asterisk (*): negative balances appear because the calculations include N and P removal/retention in the streambed, that is, in terms of both N and P, removal in the streambed stretches 3-4 and 5-6 between the measuring points. There is a small storage lake between points 5 and 6, in which intensive denitrification and P sedimentation did take place. Adapted from Kuusemets V and Mander Ü (2002) Nutrient flows and management of a small watershed. Landscape Ecology. 17(S.1): 59-68.
aArable land planned to be converted into less intensively used grasslands. bForest or bush directly on the stream bank. Adapted from Mander U, Kull A, Kuusemets V, and Tamm T (2000) Nutrient runoff dynamics in a rural catchment: Influence of land use changes, climatic fluctuations and ecotechnological measures. Ecological Engineering 14(4): 405 417.
respectively, the Vanda subcatchment had only 0.2 and 56 ha buffering areas. In 1990, additional buffer zones and riparian buffer strips were planned to control non point pollution from both subcatchments (Table 2). In 1990 and 1991, 0.1 and 0.2 ha gray alder stands were planted in the Sipe and Vanda subcatchments, respectively. A further decrease in agriculture led to the cancellation of the planned work. However, as result of the land abandon ment process, from 1990 to 1997 the area of arable lands decreased 224.1 and 61.6 ha, respectively. In the Sipe sub catchment, it was c. 10 times more than was planned to be converted into the buffer zones, whereas in the Vanda sub catchment it makes up only about half (Table 2). In fact, this extensification was not a planned process, and it was not only riparian territories that were set aside. However, the measured decrease in nitrogen runoff is many times higher than the estimated effect of planned buffer zones and buffer strips. It seems that the nitrogen losses are related more to the entire fertilization load than riparian buffers. In terms of phosphorus, this relationship is more complex, but in the areas with low potential erosion, the fertilization level deter mines the losses. It should be noted that the methodology for estimating the efficiency of planned buffer zones and buffer strips has been developed for a determined level of fertiliza tion (i.e., at the end of the 1980s in the Porijogi catchment: 150 kg N ha 1 yr 1 and 60 kg P ha Jyr J). In addition, cli matic and hydrological factors (e.g., increasing water discharge) were not considered in this method. However, the saturation of buffer ecosystems with phosphorus and also increased N release when initial lat eral flow into the buffer zones decreases are problems that need to be solved when propagating buffering ecosystems as a long term measure in watershed management. In the case of increasing agricultural activities in the catchment, the following principles are recommended: (1) all existing and riparian buffer strips should be main tained and regularly harvested; (2) as an alternative to riparian buffer strips, small, 0.5-1.0 m deep sedimenta tion ponds with aquatic macrophytes should be constructed in the gullies and other depressions within the catchment area; and (3) in riparian zones, land use intensification (i.e., the conversion of grasslands into ara ble lands) should be avoided or compensated for through wider or additional buffer strips.